SelbySoft, Inc has partnered with PerfectCube to provide some exciting new reporting options. With PerfectCube, you can see your data from virtually any device. 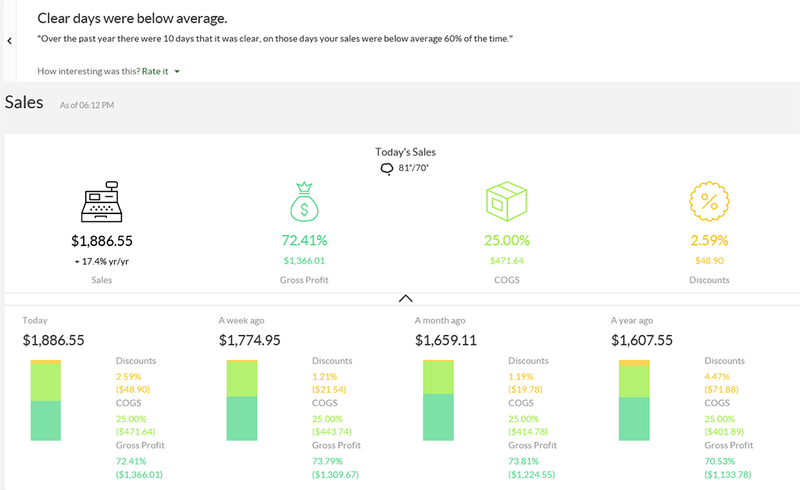 Better yet, you will be able to see what your trends are over time, labor and cost of goods sold. You know that our Coffee & Pizza point of sale already provides this right? So why did we integrate? Because we know that sometimes it is not about data, it’s about the analytics. With PerfectCube, SP-1 by SelbySoft can show you that hot days have lower sales than cloudy days and more. They can even look at predicting what your sales for the next week should be! Every year we hear about some firm that has a huge credit card breach. Usually it is some targeted event that involves a team of hackers to steal all the credit card information. What we don’t hear about are the smaller, more personal attacks that cost small businesses money each year. I went back through my notes from last year and found that I personally heard stories that added up to around $50,000 in theft from owners. That does not include the conversations other people in our company have with our customers. Some of this is theft of time (clocking in when not there), employees handing out free or discounted drinks, ticket edits and voids, inventory theft etc. One of the most brazen was the manager who simply took money from the till at night ($10-$30) and then told the owner that the reports must be wrong! As you can imagine, a lot of this theft is somewhat avoidable. Here are some things you can do to insure you are not being taken advantage of. Upgrade to version 7.60 or higher of SP-1. In Version 7.60 and higher, the password storage has been encrypted (more so than before) so an employee can’t skim the passwords directly from a data file. Additionally, 7.60 and up require ‘strong’ password rules. 7 or 8 character passwords. Must have a combination of letters and numbers. Forced to expire every 90 days. Start using employee swipe cards. Those are better than having someone see your password and code. Better yet, spend the $125 and upgrade to a fingerprint id system. Make sure that employees are using their own unique log in. Please, don’t have a ‘cashier’ code that everyone shares! Review your security. Does every employee need complete access to everything? Close out the drawer between shifts. This will really help make your employees aware that you are on top of things. Think about a blind shift close. With a blind shift close, your employees don’t know what is supposed to be in the drawer. Institute assigning employees to the cash drawer if possible. If you limit access to the cash, you limit access to stealing it. While you are at it, setup multiple cash drawers if needed. How many voids and edited voids are happening? If these numbers increase, start looking more closely. Run the employee summary report and see which employees have more voids. Look for significant differences. Check your hourly time audits and see if employees are changing their hours. Then go back and review your security again! Check your ticket audits. Are employees voiding tickets after the fact? Sign up for MobileDash. Get hourly reports as well as alerts on voids, edits and reductions. This by no means covers all the ways that SP-1 can help but it should be a good start. It’s been a while since we showed off the MobileDash reporting that SP-1 by SelbySoft is capable of. MobileDash is one of the remote reporting options that we have available for customers of our SP-1 point of sale system. This option is $10/month or included with our Corporate Reporting and Enterprise options. What can MobileDash do for you? Simple. . . Provide on the fly and hourly reporting to your email or cell phone. This is a great tool for staying on top of what is happening in the store, especially if you are not working the store on a regular basis. Even better, MobileDash comes with MobileAlerts to notify you of potential theft and other situations. Since we allow multiple email addresses to be added, you can even have your coffee shop manager or restaurant manager receive the alerts! Theft is never a pretty things to talk about is it? We all know that it happens but we like to believe that it’s at the “other guys” store right? SP-1 has some specific tools to help you identify and control theft. 1) Employee Summary – This report will show you, by employee, a total count of voids over a time period. This is a great way to identify specific employees that may be involved with theft. 2) Business Summary – This report has a section that shows you the total new and edited voids. New voids are tickets that were voided before accepting payment and edited voids are tickets that were re-opened. 3) Balance Till – One column on the balance has the employee code that re-opened the ticket. A great place to check if you suspect something is going on. 4) Dashboard – The dashboard shows the total number of void tickets on the fly. 5) MobileDash – Our MobileDash option ($10/month) will email when voids and no sales occur on the fly. 6) Audit Reporting – SP-1 has a built in “camera” feature that saves what the ticket looked like before and after it was edited. There you go, six methods of controlling and tracking theft. Do you have multiple locations? We all know that moving from store one to store 2 or 20 can be tough. You simply cannot be two places at once! Maybe you only have one location but have quite a bit of distance to travel. If either of these situations seem familiar, then our Corporate Reporting option is what you are looking for. Our Corporate Reporting option is a great way to stay on top of multiple locations. The Corporate Reporting software will allow you to review reporting from any of the locations that are active right from your home, laptop or office. Once this is setup, the store locations will automatically transmit the sales information from the store to the corporate software. On the corporate side you can see any reporting information from the previous day back to the first day you used SP-1. This gives you the ability to manage the reporting for your business without having to interrupt the location. This software package also allows you to handle multi-location gift and loyalty for free. With this option, you can seamlessly share, in real time, gift and loyalty cards between locations. Finally our MobileDash and MobileAlerts systems are included with the purchase of the Corporate Reporting software. MobileDash allows you to receive hourly email updates from your store locations. MobileAlerts will send real-time alerts from the store when tickets are voided, audit triggers are met, employees clock in and more. Need more? Call and ask us about our Full Corporate package and Enterprise options. Our MobileDash system has been around for a couple of years now but there are still some of our customers that have yet to experience it. MobileDash allows you to receive hourly sales updates through email on your phone, tablet or desktop. These updates are sent directly from the store to you. Your employees at the store level don’t even need to know that you can receive this reporting. That helps you stay on top of things. New to 2012 is a column that shows the report from the last hour reported on. See the example below for some details. Notification on employee clock in. Alerts if a ticket is voided. Alerts if a no sale is performed. Audit reports if an employee attempts to alter a previous ticket. By the way, call us for a free 45 day trial of MobileDash if you are not already using it! Is Your Coffee Shop Manager Buried? It’s a good to be busy isn’t it? It’s bad when your coffee shop manager does not have the proper tools to figure out what is going on. MobileDash – This will allow your manager to receive alerts even when they are not in the store. Many of our customers find that the manager can check their cell phone easier than the POS. Dashboard – It goes beyond knowing where the sales numbers are at. Checking to see what the labor is on the fly and seeing how sales are compared to last week, last month and last year are vital. Employee Summary – Being able to quickly see what the total sales by employee and more importantly what the total voids were by employee. Hourly Recap by Week – Having information on how many tickets were created by the hour (or 1/2 hour) of the day gives your coffee shop manager the ability to better plan and execute labor hours. Recently I was talking to a client that is opening a new store. One of their concerns was on how to keep the cash sorted out with their employees. It is a great question and one that is answered differently for every store. I’ll try and hit the highlights on methods that SP-1 can use to help you stay on top of it. First we need to know the different areas where employees handle cash. Two of them, delivery drivers and servers (think table service) are easily accounted for because you will most likely have them carry a bank. When using server / drive banking, the cash accountability issue is pretty easy. These employees will simply cash out and match up against the server or driver close out report. Assign employees to cash drawers. This locks down the cash to only the employee assigned. Use Employee Swipe Cards instead of codes and passwords. It is far more secure. Use Fingerprint ID instead of Employee Swipe Cards. It is the most secure. Buy an extra insert for the cash drawer (with or without a locking lid). That way you can quickly handle shift changes with minimum disruption. Buy multiple cash drawers. Employee one is assigned to drawer one and employee two is assigned to drawer two. If they are short, you know where to go. Don’t leave the key in the drawer! Integrate your credit cards with the POS – that way you don’t have cash / credit discrepencies. Questions? Call us and ask us how to handle all of this in detail! Are you using our MobileDash feature? If so, you have probably started to use the MobileAlerts feature as well. One of the key parts of the MobileAlerts is the void and audit tracking. I thought it would be fun to explore this further in a blog. Note that all of the void and edited ticket examples assume that the employee has the security to actually perform the action. If you lock them out, then there is no way for them to even do this. The first example and scenario is that an employee completed a ticket and then re-opened it and voided that same ticket. In this example, we see that the ticekt was re-opened at 10:44am by John Smith on workstation one. The ticket was then voided by John as well. We can see that they voided the entire ticket, that it originally had 13 line items (not menu items) and that the price was originally $9.24. This next example shows an employee that has re-opened a ticket and then deleted an item off. John Smith re-opened the ticket and reduced the total sales amount at 10:43 on workstation one. The original ticket had 16 items and a total balance of $10.71. After the reduction, the ticket has 7 items and $5.48 as the total balance. This final example shows that the employee has changed the price of an item (most likely through size). John Smith (boy ,he is a troublemaker) opened the ticket at 10:43 on workstation one and changed something that resulted in the price dropping from $10.10 to $9.28. The number of items (14) stayed the same so we know that he either deleted an item and replaced it with a lower cost item or changed the item directly to a lower cost item. So there you have it. Three ways to read the MobileAlert information coming to your cell phone! 1) Labor. This is a huge expense in most coffee shops. The owner should work to put together some guidelines on where labor should be and then stick to it. SP-1 can help by showing the labor cost both on the Business Summary and on the Dashboard screen. 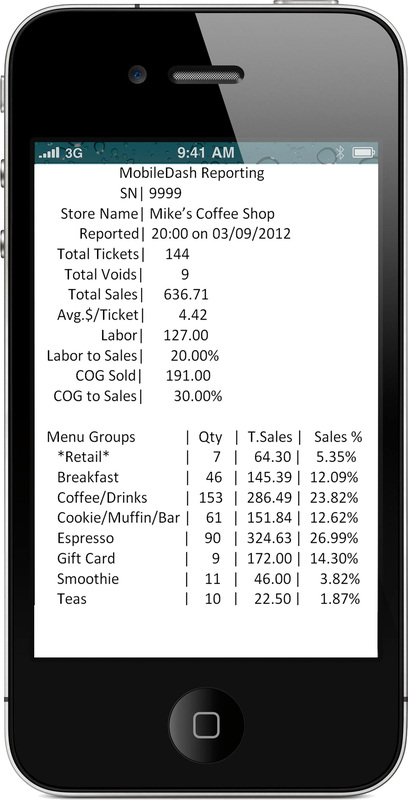 This gives your coffee shop manager the ability to know where they stand on an hourly basis. If your manager is not in the store all the time, then consider adding them to the MobilDash system so they get alerts on their smartphone. 2) Hourly Sales and Ticket Totals. Using the Hourly Recap By Week report, your manger can make sure that they know when the busy times are based on how many tickets were created. Better yet, this report can be organized by menu group so you know what to plan for during those hours. 3) Voids by Employee. Our Employee Summary report is designed to show you, by employee, the total sales and voids. This is a great way to spot red flags and see what may be happening in your store!